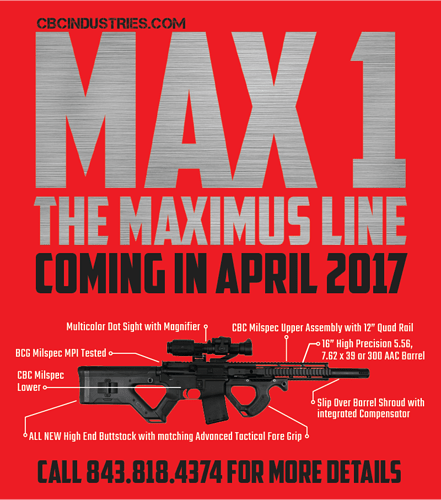 Introducing the CBC Industries new Maximus Line with the Max 1. 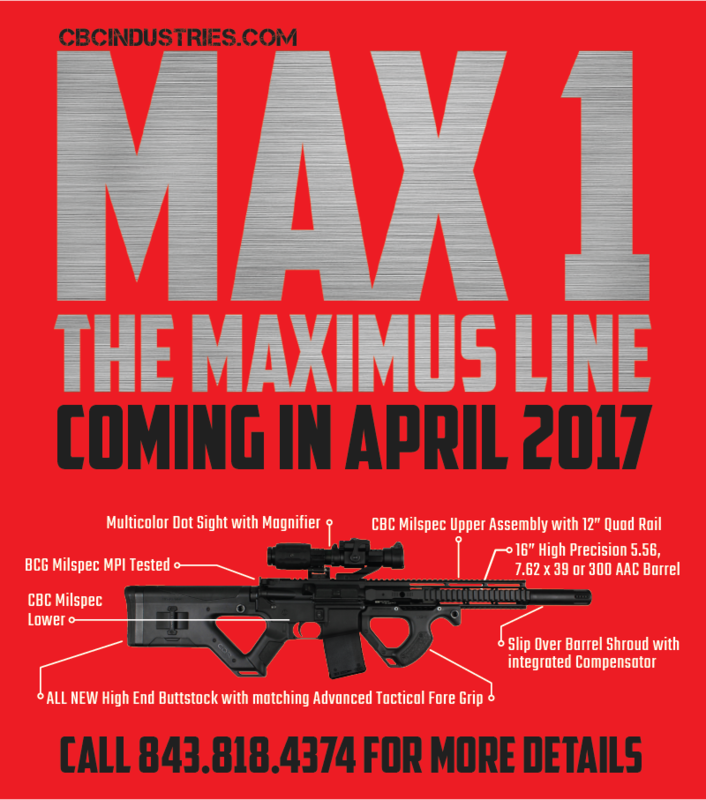 The Max 1 is an out of the box ready to rock Gladius for the modern combat arena, perfect for 3-gun completion or just having the coolest gun at the range. The barrel is 16” Chrome moly steel barrel chambered in 5.56x 45 with a 1/8 twist; 7.62x39 with a 1/10 twist; 300 AAC with a 1/8 twist. A 5½” Aluminum barrel shroud that recesses 4” over the barrel with an integrated 1½” muzzle compensator for enhanced ruggedness. A 12” Integrated rail system style hand guard with full length MILSTD 1913 Picatinny Rails at the 3, 6, 9 and 12 o’clock positions to accommodate your accessories. A CQR Enhanced Tactical polymer buttstock and matching foregrip to entertain multiple hand positions for easy transition through a wide range of shooting styles. A M16 style Bolt carrier is made from case hardened 8620 steel with a salt bath nitride coating and comes with a case hardened, magnetically particle inspected 9310 steel bolt. A Milspec 6065 T6 aluminum charging handle with enhanced steel clasp lever and a Universal ambidextrous steel safety selector Switch are included for use by both left and right handed shooters. A multi-color Dot sight with selectable red/green 3 MOA target dot and 5 brightness settings for quick target acquisition. Elevation and windage adjustments are 1 click = ½ MOA. The Dot sight is paired with a flip-up 3X magnifier for those longer and more precise shots.